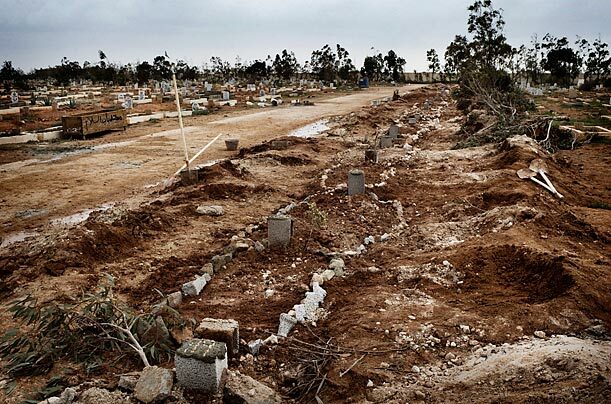 Gaddafi represents death — freshlu-dug graves in Benghazi, where many lives were lost seizing the city from his regime. Right now, Gaddafi is a big danger to black Africa. Any black person found in Libya is likely to be given very short shrift by the white-skinned section of the Arab population, which believes that Gaddafi has imported — or is importing – blacks from Chad, Nigeria, Ghana, Burkina Faso, Liberia and anywhere else that he has followers, to go and fight for him. One Ghanaian who was among the first batch of 150 that safely returned home, told reporters that some blacks were being caught and “beheaded”. Others were being imprisoned. There are estimated to be a further 10,000 Ghanaians in Libya, whom the Ghana Government is trying to evacuate home. ‘Fighting’ for Gaddafi is dangerous, because it largely consists of sitting safely in speeding cars and letting off gunfire from automatic weapons into unarmed crowds. I am, of course, not in Libya, thank God, and so cannot vouch for the way Gaddafi’s black ‘mercenaries’ are said to be going on killing sprees. But in an insurrectionary situation, truth spreads very fast – simply because people need it to survive. When you are running for your life and someone asks you why, you normally don’t have enough time to weave a propaganda web and toss it at him. Your human instinct tells you to warn him of exactly the danger that is making you run. The question is: what should the rest of Africa think of Gaddafi’s troubles? I shall give you three quotes – one from South Africa, one from Nigeria, and one from Ghana – which should help you to determine whether you want Gaddafi to continue unleashing untold bloodshed on Libya, in order to rule Libya (after having had 41 good years of autocratic rule) or not. “So why did the world’s political community, which normally does not suffer fools, tolerate this madman? Short answer: he paid a lot of people good money. 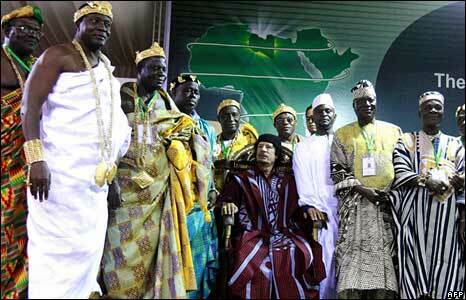 How much were these chiefs from Africa paid by Gaddafi to acknowledge him as ‘King if Kings’ of Africa? He had many presidents, prime ministers and kings on his payroll. He also filled the coffers of some nations and financed the election campaigns of many parties. If you ventured into downtown Johannesburg and visited some important political buildings you may well have heard interesting stories about bags that were brought back from visits to Tripoli. It explains Africa’s failure to loudly condemn the slaughter on the streets of Libyan cities – and the mealy-mouthed statements from a certain building in central Johannesburg about the Libyan government and the people “seeking a political solution”, when civilians were being butchered. It is not easy to condemn a paymaster without qualifying your condemnation. A lunatic like Gaddafi should never have been allowed to hide behind the fig leaf of national sovereignty and rule an oil-rich nation for more than 40 years. We may all laugh at him and condemn him, but we should be laughing at and condemning ourselves. That is quite unequivocal: Mr Makhanya is suggesting that the South African ruling party, the ANC, had obtained a great deal of largesse from Gaddafi and so was prepared to close its eyes to the wanton killings that Gaddafi’s militias were directing at the people of Libya. That is a damning verdict on the ANC, which, we all know, gained a lot of sympathy world-wide, when bloodshed was unleashed on the black people of South Africa at Sharpeville on 21 March 1960 and in Soweto on 16 June 1976. These are but two of the very bad dates for black South Africans that should make the ANC more concerned about bloodshed unleashed on unarmed people anywhere. Again, the importance of the quote cannot be over-emphasised. 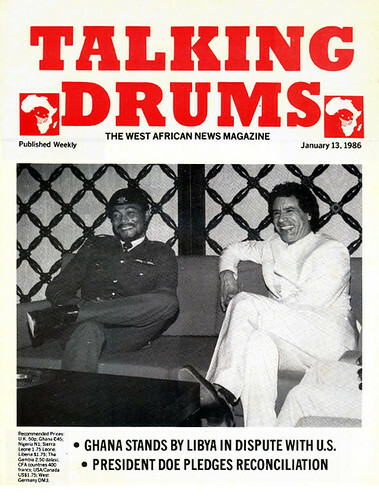 One of the most prestigious publications in Africa’s most populous country, had drawn attention to the contradiction between Gaddafi’s words and his deeds – especially as concerned Africans, the alleged ultimate beneficiaries of his efforts aimed at achieving a ‘United States of Africa’. I could go on and give chapter and verse about Gaddafi’s similar standing in countries like Uganda — where his arrogant bodyguards were nearly engaged in a shootout with Ugandan security personnel – but let me come back home to Ghana. “Gaddafi taking over Ghana,” she said. I howled so loudly with laughter that everyone in the restaurant stared at me as if I had gone bonkers. “Gaddafi circumcise us? Let him come and try!” I said, wiping the tears from my eyes. ‘The Libyan Government has deported another batch of 132 Ghanaians living in that country. ‘This brings to 6,027, the total number of such deportees since the Libyan Government began the exercise… The deportees had been coming in on regular intervals of between two weeks and one month. They were brought in “aboard a cargo flight”. ‘Airport sources said that “apart from the first batch, which was brought in aboard a passenger plane, the rest had always been on cargo planes which had no seats… In an interview, some of the deportees alleged that the conditions at the camp had been dehumanising, since there were no sleeping places. Is it any wonder then that only politicians who have taken Gaddafi’s shilling, have any tears to shed for him on his day of reckoning with his own people? To anyone else, especially those 6,000 or more Ghanaians who were sent back to Ghana as mere cargo, Gaddafi’s fall is to be welcomed as good riddance to good rubbish.